My super simple definition of trauma. 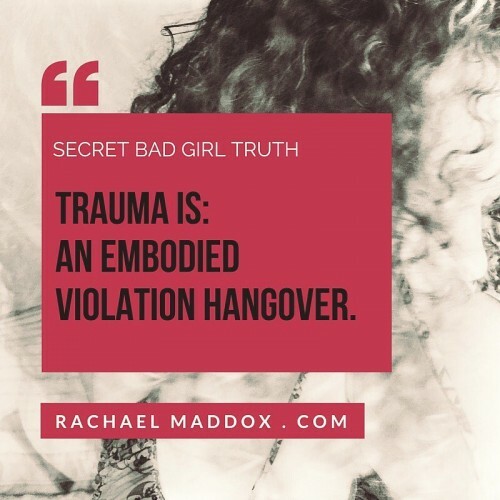 Trauma is an embodied violation hangover. In other words, trauma is the residual energy that’s stuck in one’s body long after a violation, shock, or a dangerous experience or relationship has ended. The only difference between a violation hangover and a substance hangover, is a violation hangover can last much, much longer; weeks, months, years, decades—even intergenerational periods of time. And perhaps if you’ve been reading my writing for a while, or watching my trauma talks, you’ll notice that I refer to trauma as a “spell”. Why? Because it’s something that’s usually occurring below our conscious minds, out of reach of our cognitive capacities. And this is why it lingers so long, so often and so mercilessly. So, could you have trauma and not know it? I’m not asking this question to rouse a flag or diagnose you with One More Thing you have to Fix in the world of your Personal Enlightenment. I’m asking because the approach to working with and resolving trauma is really different than how you might approach more psychological struggles. You want to be able to identify if you have trauma or not so that if you do you can get the most appropriate support for transforming it. When we hear the word “trauma” we normally think of things like people coming out of war zones or survivors of intense forms of abuse. We less often think of fear-based stress from adverse childhood experiences or emotionally violate relationships as causes of trauma. We less often think that being raped once or twice, or experiencing strange instances of harassment, could leave us with an embodied violation hangover that impacts a lot of how we move through the world. But that “less often” notion of trauma is a wildly pervasive, unconsciously experienced reality. The good news is: trauma is resolvable. Your body, spirit and mind can all return to their natural blueprint of health, power and vitality. Does that mean it’s easy to resolve? Or that resolving trauma means living life problem-free? Nope. But the ways in which your body unconsciously reacts from a place of past wounding and past fear, rather than present capacity and stability, can shift. Your triggers can significantly loosen. Your cognitive functioning can significantly enhance. And when these things happen? Your empowerment can happen with greater efficiency. So, what’s the best way to gauge if you have trauma? Ask your body. ‘Cause that’s where it lives. Your body might not answer in words. It might answer in heat or tears or tension or deep fear. But if it answers, I’m inviting you to listen. There’s a whole world of health and aliveness available to you in that sacred conversation. 29 Medal-Worthy Causes of Trauma (for people who think their violation wasn’t big enough). “Know better” but still chronically f*cking up? PPS–Pretty sure you’re under the trauma spell, and ready for help breaking it? I’ve got a one-on-one program for that. I’d love to set up a free consultation call. Just fill out the application at the bottom of the page, and I’ll be in touch within 2 business days. Tanks for such a helpful site.